With the 2018 election season in full swing, political marketers are making their final decisions about where to spend campaign advertising dollars. A major consideration in these spending decisions is the credibility of the media options available. Everyone wants to know if voters will trust the information they are receiving? Following the 2016 elections, the United States Postal Service conducted a survey of Virginia voters. The USPS explored the perception of authenticity by voters of different forms of political outreach. The results of the survey showed that voters ranked direct mail as the most credible form of political advertising. 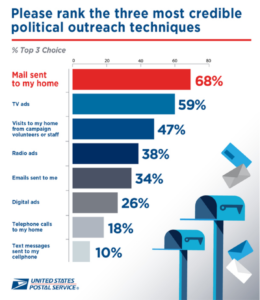 Somewhat surprisingly, 68% of voters surveyed ranked direct mail among their top three most credible forms of political outreach. This was greater than TV (59%), in-home visits (47%) and digital ads (26%). Additionally, over half of surveyed Millennials (55%) indicated that mail was helpful in reaching a voting decision, a rate greater than Gen Xers (45%) and Baby Boomers (38%). 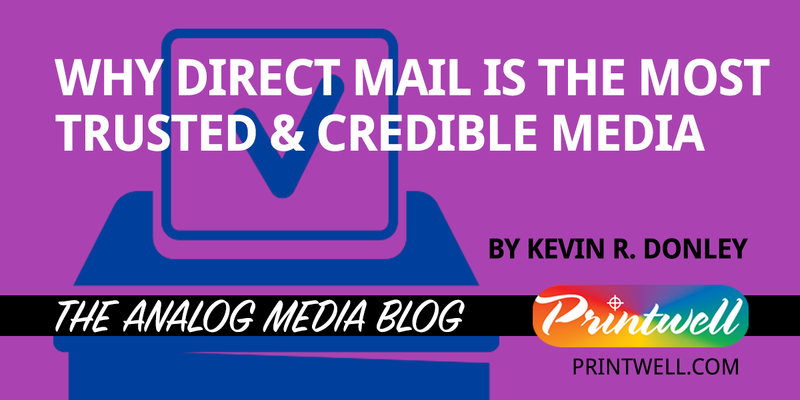 Direct mail has emerged as the most trusted form of marketing and advertising media while consumers have increasingly called the reliability of social media, online and email marketing into question. According to the 2018 Edelman Trust Barometer, public trust within the U.S. has “suffered the largest-ever-recorded drop in the survey’s history among the general population.” The Edelman index measures public trust in government, business, media and NGOs. The trust numbers fell in 2018 by between 10 and 20 points in each of these categories. The decline in overall trust is in part the product of the public’s experience with false information found most commonly in digital media forms. Direct mail costs money: When consumers receive an item in their mailbox, they know that the company that sent it to them had to spend significant dollars to design, print and mail the piece. As opposed to email and social media marketing, where costs per address or impression are pennies or fractions of a penny, ink and paper direct mail campaigns are seen by recipients as having a value and inherent credibility. Direct mail is personalized: Direct mail marketers have been taking advantage of personalization for decades. With the latest in variable digital printing today, direct mail is capabile of significant innovation in personalization techniques. Direct mail is not intrusive: it is estimated that consumers are bombarded with several thousand marketing messages each day. TV, radio, email and social media advertising are intrusive in that they interrupt the consumer and can stop them from doing what they set out to do. With direct mail, consumers go to the mail box when they are ready and sort through each item to see who it is from. These items are either discarded, looked at immediately or set aside for later review.